Lots of new footage in this one! Check it out here! 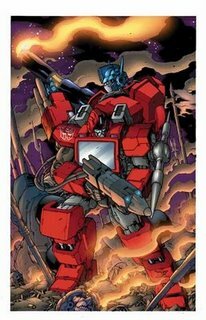 Sales on “All Hail Megatron” have been strong enough that the previously mentioned coda series will comprise issues 13-16 rather than be a seperate series of their own. See Chris Ryall’s comments here. The footage that Micheal Bay previewed at ShoWest is available for viewing here. Great stuff, including one two-minute scene between Sam and Bumblebee, and a montage of Transformer footage, including a shot of Devastator.